The Calumet Region is the name given to the geographic areas drained by the Grand Calumet River and the Little Calumet River of northwestern Illinois and Indiana. In this region, many Chicago-destined rail lines that come from the east make a turn along with the southern edge of Lake Michigan. Several north-south lines radiating from the city cross these lines, making for a good deal of rail intersections within a very compact area. Add in all the heavy industry along the lakeshore and one can see why to this day there's such a proliferation of rail traffic in this geographical region. In volume one of our two part series we will examine several rail operations of the region, mainly within the state of Illinois. Locations included are Blue Island, Harvey Junction, Riverdale, the Dolton area, a brief glimpse of the Chicago Rail Link, and then we will work our way east towards many locations just inside the Illinois/Indiana border. A few scenes in the Hoosier state will be seen in our look at some South Shore operations and the final segments at Hohman Avenue and Hammond, Indiana. 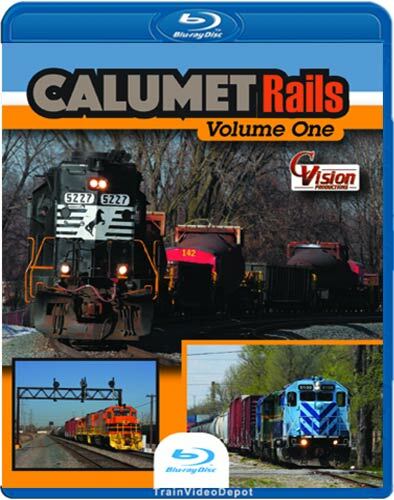 This area is rife with rail traffic so be sure not to miss all the action in Calumet Rails, Volume One from C. Vision Productions. chris collins (fletcher north carolina) on 2019-03-03 19:19:08. Rail Buff (Sohern California) on 2016-06-06 12:55:20. I am posting this review for both Volumes in both places Trains, trains and more trains! If that's what you like you won't go wrong with this one. Little to no scenic shots. If you like the sound of steel wheels on diamonds there's a plethora of that too. Many trains going in different directions on many tracks simultaneously, that too, especially in Volume 2. Also lots of mixed motive power. The descriptive squib said that this was a busy place and were they ever right! I was a little leery of buying these two volumes (in Blue Ray) but after watching them I'm glad I did. These are my first from this producer, but I doubt they will be my last. Charley Mann (Little Mountain) on 2016-02-15 14:58:35. Have viewed this program several times, and it's very interesting, Has a good variety of motive power including CN Cowl units, ex.UP SD90macs and many older EMD types, along with modern GE and EMD power from CSX, NS and BNSF.